The word “inspirational” is what makes this question interesting to me. Lean is usually introduced by company presidents in non-inspiring ways and which leave workers suspicious of management’s intentions. This likely accounts for why the results from most Lean transformations soon fall far below expectations. Most leaders start by dryly articulating business needs, followed immediately by a high-level explanation of a few technical elements, and then introduce the implementation plan. They leave out the social details, believing them to be unimportant. I call this the “Lean for Owners” method. I would not introduce Lean that way, in large part because it does not respect workers. And also because workers will not follow a leader who knows nothing about Lean. Decades of experience clearly informs us that the “Lean for Owners” method of introducing Lean is a loser. Instead, I would reverse the process, addressing the social details first and the technical and business details last. In other words, present Lean from the workers’ perspective, not selfishly from management’s perspective. After all, workers are the customers of the management practice. I call this the “Lean for Workers” method. I would introduce Lean in a patient, step-wise fashion, allowing time for workers to comprehend the upcoming changes in thinking and daily routine that are being asked of them. In this way, workers are respected, which is a smarter way to start. Introduce Lean in four steps over a period of one month or so, carefully preparing the ground for acceptance. Focus each step on inspiring workers to achieve greatness; to believe in themselves and their capabilities for doing things that they never thought they could do. Emphasize inspiration in each step of the introduction to create demand for Lean by workers, rather than letting workers think that Lean is being forced onto them by management. Pre-Work: In order to introduce Lean accurately and to be able to answer workers’ questions, top managers should spend a few months doing some homework. They should learn about Lean from various (good) resources, focusing intently on social aspects, flow, and kaizen. Leaders should participate in at least one shop floor kaizen whose objective is to create flow. This learn-by-doing will enable leaders to explain the kaizen process (and features related to time, such as the time from idea-to-test-to-practice), desired social and technical outcomes, and the nuances and details that workers will no doubt ask them about. Week 1: Vividly describe what a better life at work can look like for workers. It would include simplification of the job, better safety, less stress, fewer errors, better relationships among workers and managers, improved financial and non-financial results, and so on. Briefly describe how managers will think and do things differently to help realize a better life for workers, and commit to workers that nobody will be discharged as a result of process improvement. Then, roam the workplace for many hours each day for the next several days to answer questions that workers have, preferably one-by-one. Week 2: Introduce the fundamental objective of Lean: Material and information flow. Describe a few key differences between the current processing method, batch-and-queue, and flow. Then, roam the workplace for many hours each day for the next several days to answer questions that workers have, preferably one-by-one. Week 3: Introduce the process for creating a Lean organization: Kaizen. Explain, in some detail, Toyota-style, industrial engineering-based kaizen. Focus on how kaizen is good for people; how it stimulates thinking and generates ideas, and is a fun activity because it engages people to be creative and innovative. Then, roam the workplace for many hours each day for the next several days to answer questions that workers have, preferably one-by-one. Week 4: Introduce the business need for kaizen, and reinforce the tight link between how kaizen helps grow both people and the business. Explain the buyers’ market that you face, how kaizen helps an organization respond to this type of market (shorter lead-time, lower costs, better quality, etc. ), and management’s vision for growth of success. Then, roam the workplace for many hours each day for the next several days to answer questions that workers have, preferably one-by-one. Week 5 and Forever After: Kaizen, followed by kaizen, kaizen, kaizen, kaizen, kaizen, kaizen… lots of kaizen led by highly capable facilitators. Managers must participate in kaizen as team members, not in their role as managers, and exhibit enthusiasm for what they and workers have learned and accomplished. Then, follow-up with workers post-kaizen to understand their experience, quickly share and apply learnings elsewhere in the organization, identify other processes to improve, identify opportunities to improve the kaizen process itself, and so on – preferably one-by-one. Keep the inspiration alive! 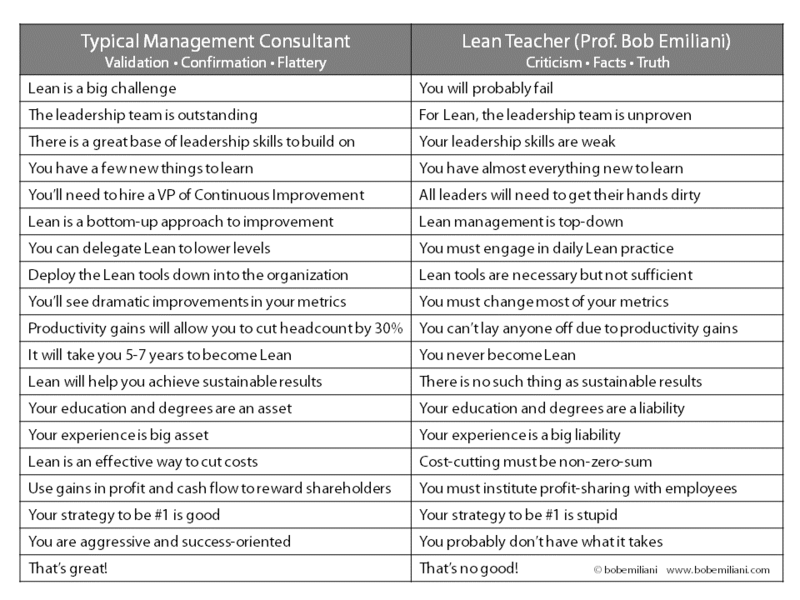 I would not advise following the prescribed model of any organization whose business it is to promote Lean. Their models are derivatives of Toyota’s approach, and they typically discount or ignore kaizen. 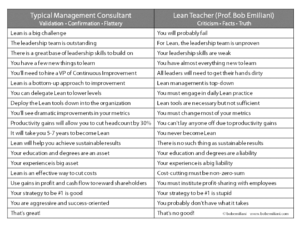 While there are some similarities between Lean (a poor interpretation of Toyota’s production system made by researchers at MIT) and Toyota’s management practice, there are many significant differences. It is better to follow Toyota’s lead and others who have carefully followed Toyota’s lead (versus carelessly). In all cases, you will find kaizen is the key. Thank you for posting something good for society!